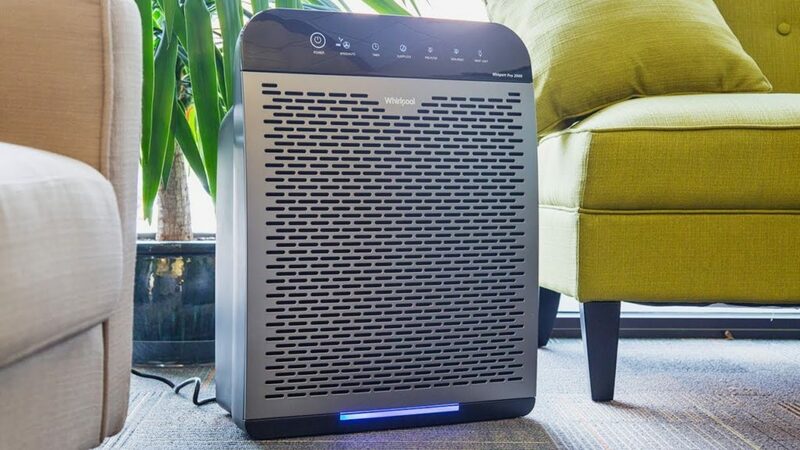 Whirlpool - WPPRO2000: Air Purifier Review • The Air Geeks, reviews of air conditioners, dehumidifiers and air purifiers. The Whirlpool WPPRO2000 air purifier is one of the most powerful air cleaning solutions. Set up in a 508 square feet space, it has the ability to clean the air in 13 minutes! This air purifier features a True HEPA that removes up to 99.97% of airborne particles from the air and a carbon filter. With this, the indoor air in your room will be free of allergens, dust, mold spores, pollen, pet dander, smoke and odors. In case you are interested in this unit and you are planning to order it, then it is likely that you are looking for more information about it. We have made this easy for you. We have tested and researched about this unit to bring you information that you can depend on to make an informed decision. Here are the features, strengths and the weaknesses of the Whirlpool WPPRO2000. The WPPRO2000 air purifier is a strong air cleaning solution recommended for spaces that measure up to 508 square feet. Its filtration system comprises of a True HEPA filter and an active carbon filter. Its True HEPA filter can capture particles that are as small as 0.3 microns. The True HEPA filter rids the air of allergens such as dust, pollen, pet dander, and mold spores. On the other hand, the carbon filter absorbs odors as well as capturing large particles that might destroy your HEPA filter. It is good to note that the HEPA filters need to be replaced after every 12 months and active carbon filters every 3 months. Another good thing about this unit is that it has indicator lights that alert you when filters need to be replaced. Are you concerned about energy consumption when running your machine? Well, this unit offers an Energy Saver mode that allows it to run on low fan speed. You can also choose to run it on medium, high, or turbo mode depending on your air cleaning needs. The WPPRO2000 air purifier uses sensors to detect the quality of air in your room. The unit uses the measurements taken by these sensors to automatically increase or lower the speed of the fan. This feature allows you to relax without worrying about the quality of air in your room. Are you looking for a unit that will not disturb you when you are sleeping or working? The WPPRO2000 is designed to ensure that you have your peace as it does its job of cleaning the air you are breathing. The unit features the Quiet Partner System, which is one of the quietest and most efficient air purifier technologies, that ensures that your room is quiet. This feature makes this air purifier a suitable choice for spaces that demand quietness such as bedrooms and offices. Are you searching for an air purifier that can clean the air in your room even in your absence? Well, you got it! The WPPRO2000 features a programmable timer that allows you to plan when you want the unit to purify the air in your room. With this feature, the unit can do its job even when you are not in the house. Efficient air purification – in a room of 508 square feet, this air purifier can clean the air in just 13 minutes! Automatically adjusts fan speed – the built-in air quality and VOCs sensors can detect even the slightest change in indoor air quality and this triggers the air purifier to automatically adjust the fan speed accordingly. Whisper quiet – this air purifier employs the Quiet Partner System which offers a whisper quiet environment in your room. Requires constant filter replacement – the HEPA filter needs to be replaced every 12 months while the active carbon filters should be replaced every 3 months. This could get costly in the long run. I had the old model version of this that wasn't quite as feature laden as this one and it has worked perfectly for well over 10 years now. If comparing the two, this new model is now even quieter than the previous and is remarkably quiet which I love! In addition, it has a sensor to monitor the air and adjust the speed of filtration accordingly. It's amazing how I can spray a bathroom cleaner in the next room from where this is located, and within a minute, this thing is able to pick-up on the chemicals released into the air and alert me (via the orange or red light on the front of the unit) and increase it's speed to aide in the filtration process which tells me it's not only doing its job, but that it is doing it even more efficiently than the old model that didn't have built-in sensors and just stayed on the speed that I set it to. The only reason I did not give this five-stars is because the unit has developed this horribly annoying, squeaking noise (like a hamster wheel) that is non-stop. Makes you want to spray some WD-40 on it but you don't know where and/or how to do that or if that would even be the right fix." I would highly recommend this unit over the Honeywell air purifiers. If you do enough research you'll learn that the Honeywell purifiers don't remove a whole lot from the air. The Whirlpool has much better seals on the HEPA filters, and it is much quieter than other units I have bought. I would recommend this unit over others any day"
The Whirlpool WPPRO2000 is a powerful air purifier capable of cleaning the air in your room within a short time. It removes air pollutants such as dust, plant pollen, mold spores, pet dander, smoke, and odors. This unit employs the True HEPA filter and the active carbon filters to ensure that the air in your room is free from airborne contaminants. Moreover, this air purifier offers energy saver mode to help you enjoy clean air without consuming excess energy. Additionally, the Whirlpool WPPRO2000 employs the Quiet Partner System to ensure that your room is as quiet as possible. On the downside, the filters of this unit require to be replaced constantly and this can become costly in the long run. Considering the impressive features of this air purifier, we highly recommend it. Now that you have all the information, be the judge and decide whether this is the best air purifier for your air cleaning needs.